A study of “MY Camelopardalis” binary system, published in the journal Astronomy & Astrophysics, shows that the most massive stars are made up by merging with other smaller stars, as predicted by theoretical models. Most of the stars in our galaxy have been formed in binary or multiple systems, some of which are “eclipsing”, this is consists of two or more stars which, observed from Earth, undergo eclipses and mutual transitsbecause of their orbital plane facing our planet. One such system is the eclipsing binary MY Camelopardalis (MY Cam). Artistic rendering of MY Cam system. The proportions between the components reflect the analysis results. The stars are deformed by its very fast rotation and the gravitational pull of the companion. Credit: Javier Lorenzo (Universidad de Alicante). The journal Astronomy & Astrophysics has published an article on MY Cam, one of the most massive star known, with the results of observations from the Calar Alto Observatory (Almería) signed by astronomers at the University of Alicante, the Astrobiology Centre of the Spanish National Research Council (CAB-CSIC) and the Canaries’ Astrophysics Institute (IAC), along with amateur astronomers. This article concludes that MY Cam is the most massive binary star observed and its components, two stars of spectral type O (blue, very hot and bright), 38 and 32 times the Sun’s mass, are still on the main sequenceand are very close to each other, with an orbital period of less than 1.2 days, in other words, the shortestorbital period in this type of stars. This indicates that the binary was virtually formed as it is now: the stars were almost in contact at the time they were formed. Stars which, like the Sun, move alone in the Galaxy by trailing only their planetary system are a minority. Most stars spend their lives tied by gravity to a companion star (forming what is called a binary system) or several (what was known as multiple system). As explained by Javier Lorenzo, from the University of Alicante and first author of article, in these systems all stars describe their orbits around a common centre of mass. In particular, the stars much more massive than the Sun contain an equivalent mass to many suns and tend to always appear in company. Recent studies suggest that these high-mass stars, that are much larger and hotter than the Sun, form part of systems with at least one other companion of comparable mass. A particularly striking example is the binary system known as MY Camelopardalis (MY Cam), in the constellation of the Giraffe. This object is the brightest star in the open cluster “Alicante 1”, which was recently identified as a small stellar nursery by researchers at the University of Alicante. Although it has been known for over fifty years that MY Cam is a high-mass star, it was only ten years ago that it was recognised as an eclipsing binary, a system in which one star passes in front of the other every time they complete their orbit, leading to changes in the brightness of the system that we perceive from Earth. This property of eclipsing binaries allows us to know many of the characteristics of the component stars through a careful study of the light that comes from them and the simple application of Newton’s law of universal gravitation. For the study of MY Cam, professional astrophysicists obtained a large number of spectra of the system with FOCES spectrograph, which operated for many years in the 2.2 m telescope of Calar Alto Observatory. Using the Doppler Effect, these spectra allow us to measure the velocities with which the stars move in their orbits. Also, astrophysicists can determine the fundamental properties of stars, as their surface temperature and its size through a comprehensive analysis of the characteristics of the spectra. To complete the work, they had the help of amateur astronomers who measured the changes in the amount of light coming from the system along the orbit, what astrophysicists call the light curve of the system. Analysis of these data has shown that MY Cam is a truly exceptional system. The light curve- as explained by Sergio Simon, IAC researcher and one of the authors of the article – shows that the orbital period of the system is only 1.2 days. Given the large size of the stars, they have to be extremely close to be able to do a full turn so quickly. The stars are moving at a speed of over one million km/h, but being so close, the tidal forces between them make them rotate about themselves with the same period, ie, each star turns on itself in just over a day, while the Sun, which is much smaller, turns on itself once every 26 days. Stars are like giant spinning tops and every point of the surface moves with a speed of over one million km/h. Each has a radius around 700 times bigger than the Earth’s, but turns on itself at about the same time. But also, the stars are extremely massive. Their masses are 38 and 32 times the Sun’s mass. Such huge stars do not fit so easily into such a small orbit and the conclusion of the study is that they are actually in touch and the material of their outer layers is mixing, giving place to a common envelope (what is known as a contact binary). MY Cam is one of the most massive contact binaries known and by far the most massive whose components are so young they have not yet begun to evolve. As stated by Ignacio Negueruela, another author from the University of Alicante, this is the most interesting aspect of MY Cam since its foreseeable future confirms some of the current theories of formation of extremely massive stars. The properties of the two components of MY Cam suggest that they are extremely young stars formed in the past two million years. This extreme youth allows us to suspect that the system was formed essentially as it is now, although perhaps the two stars were not touching initially. As they get older, their natural evolution is to become larger. Given that they have no clearance between them, this process will lead to the merger of the two stars in a single object, a real star mastodon. The details of the merger process are not known, because it has never been seen before. Some theoretical models suggest that the merger process is extremely fast, releasing a huge amount of energy in a kind of explosion. Other studies favor a less violent process, but in any event spectacular. 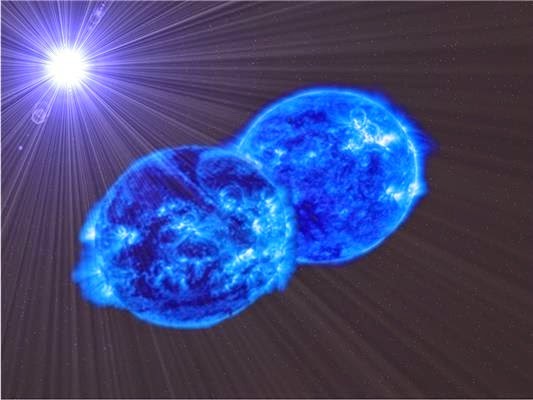 Anyway, many astrophysicists believe that the merger of the components of a close binary is probably the most effective way to generate extremely massive stars. MY Cam is the first example of a system that can lead to one of these objects.